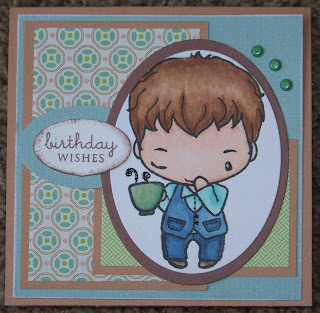 The Savvy Stamper: Cofffee Card! Hi again! This is my second post for today, so please scroll down. I make it just in the nick of time - I almost forgot to enter this card into the Papertake Weekly Challenge and it closes tonight. So here it is! I used supplies from a card kit I put together for a swap on SCS. Supplies are SU cardstock in Close to Cocoa and Creamy Caramel. Other cs is DCWV as well as the DP. Image is from the Greeting Farm colored in with Copics and highlighted with black Stickles. Sentiment is PTI Mega Mixed Messages. Brads are American Crafts. Gosh he is so stinkin cute, he is acutally on a wish list of mine right now. Georgous card, love the colors! !